Greywater represents 40% to 60% of water usage in residential buildings such as houses & apartment blocks, hotels & resorts, remote mining camps & military facilities. 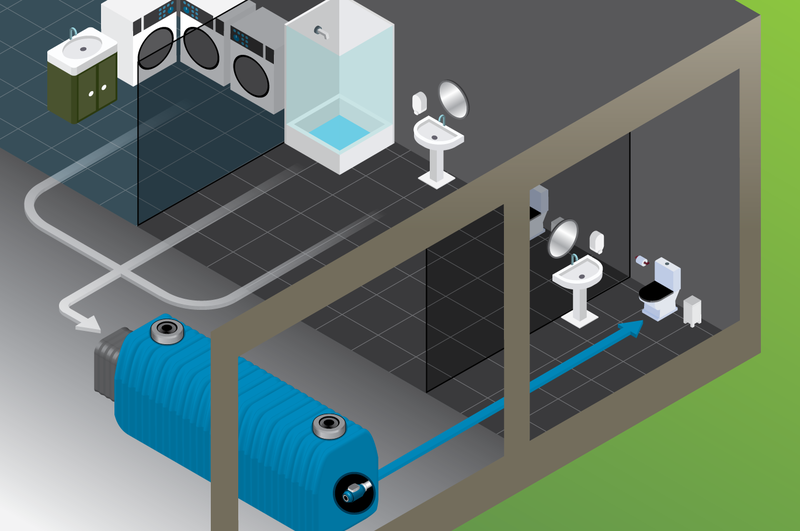 Greywater is the used water from showers, baths, hand basins and the laundry and, with the right technology, it can be captured, treated and safely reused. This simple but important initiative can substantially cut water bills, reduce the use of ”new” water and vastly improve water sustainability. The key question concerning many people is – how can you be sure it’s safe to use? Australia has the most rigorous greywater recycling approval standards in the world and, with Nubian’s systems approved for use in every Australian mainland state, you’re assured of high performance. Nubian’s unique, patented approach to treating greywater delivers high quality and high yield with the lowest footprint and energy use of any technology available. High dose ultraviolet (UV) disinfection – which attacks the DNA of bacteria, viruses and parasites causing them to lose their reproductive capability and destroying them. These 2 steps, together with the UV disinfection, provide the “Triple Barrier” protection often demanded for commercial usage approval. Water treated by Nubian’s greywater recycling systems is of a high quality with BOD and Suspended Solids levels typically less than 5 parts per million. Lowest maintenance costs of any system in its class – typically less than $2.20 per kL of treated water. All Nubian greywater recycling systems are automatic and require no intervention by the system’s owner. Nubian’s planned maintenance program together with an advanced, continuous on-line water quality monitoring system provides peace of mind for the system’s owner and for regulators. The treatment plant can be remotely managed via NuLink, Nubian’s propriety communications technology, so you can be sure of peak performance irrespective of where the system is located. Nubian systems are very compact and easy to install making them ideal for today’s space-constrained building environments. The Nubian treatment platform is also incredible flexible and can recycle from 500 up to 250,000 litres of greywater a day. Contact us to discover how Nubian greywater recycling could help you reduce your water usage by up to 60%.